Dr. Kent Blansett Presents "Richard Oakes, Alcatraz, and the Red Power Movement"
Join Dr. Kent Blansett as he presents "Richard Oakes, Alcatraz, and the Red Power Movement"; Nov. 26. Join Dr. Kent Blansett on Monday Nov. 26 at 6 P.M. as he discusses his recent book, "Richard Oakes, Alcatraz, and the Red Power Movement". "Richard Oakes, Alcatraz, and the Red Power Movement" is the first book-length biography of Richard Oakes, a Red Power activist of the 1960s who was a leader in the Alcatraz takeover and the Red Power Indigenous rights movement. The event will take place in the Milo Bail Student Center Ballroom. A book signing will follow the discussion as well as light refreshments. 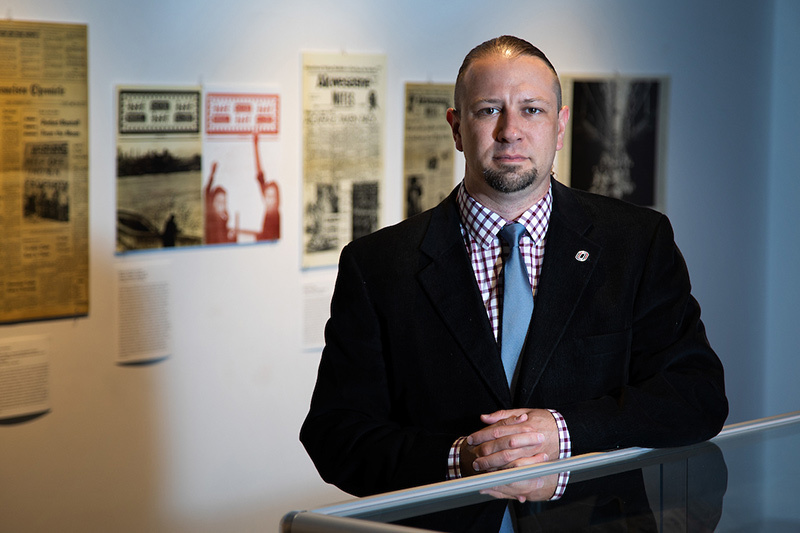 Earlier this year, Blansett curated a gallery focused on the Red Power Movement and occupation of Alcatraz, featuring dozens of peices from this own personal collection and rare, donated items including video, newspaper clippings, comic books and more. The exhibit was also reported on by the Omaha World-Herald.